I’m writing this today in a bookstore. There is no better place to write this article because I love bookstores like this. I honestly sometimes get a little concerned about the future of bookstores like this because we are in the age of Amazon Digital, but there's something about walking through a little book store. Today I walked in and smelled the paper, the print, and the ink, and I decided to get my notebook out and write this for you. I'm convinced that your effectiveness as a leader and the success of your business or ministry is directly impacted by the content that you absorb and the people that you surround yourself with. There's nothing like a good book, a good podcast, or a good conversation with someone to help you think different, respond different, and plan like never before. What kind of books have you been reading? What kind of content have you been absorbing? Many times, it's easy to get stuck. You just feel like you’re stuck between a rock and a hard place. Sometimes it feels like you’re kind of in this blah phase of life, and often the solution can be found between two covers of a book. So here we go, here's a frog I want you to eat. I talk to you about eating the frog first. Mark Twain said that if you eat a live frog first thing every morning, nothing worse can happen to you the rest of the day. So here's your frog: some of you don't like to read, and this will be a frog. I do empathize with you, however, I want you to think about the books that you were reading. What book do you need to be reading that you aren’t reading? Maybe you bought one and you just haven't opened the cover, maybe it's time to jump on Amazon, maybe it’s time to visit a bookstore and walk the aisles, maybe it is just time to find something that's going to help you. I'm a believer in reading books that you might not agree, and reading books that are written for a totally different market that you're that you're involved in. If your a pastor, don't just read ministry books. If your a business owner or entrepreneur, don't just read business or entrepreneurial books. You need to read books to help you think and stretch you. 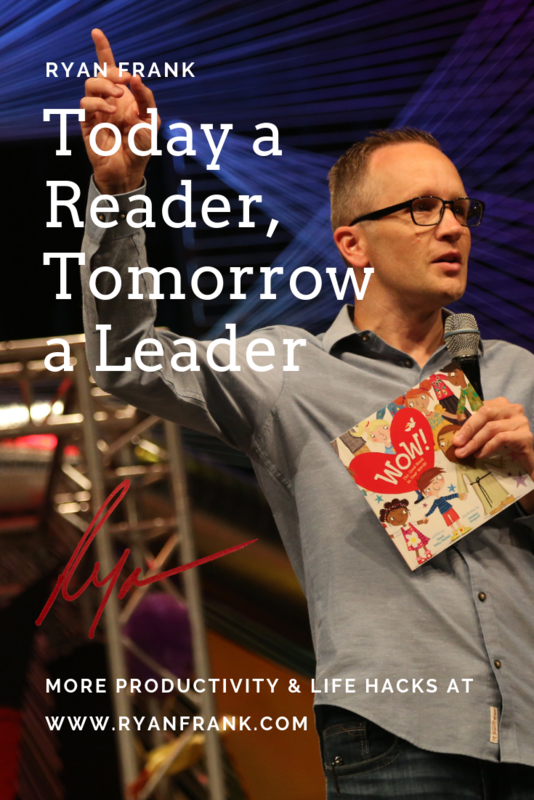 I know your life will be better for; there's an old quote (I don't know who gets the credit for) that says, “today a reader, tomorrow a leader.” There's a lot of truth to that quote. The more you read, the more content you absorb, the more you allow other voices to speak in your life, the more effective you're going to be, the more sharp you're going to be, and you'll find yourself not being stuck in a rut. You'll find yourself on the leading edge. There's my challenge for you today. Go find yourself a good book to read or to listen to. Absorb some good content to help you think different and as a result act different.